SCENE: The Grim Reaper---appearing as a skeleton clothed in a hooded robe and carrying a scythe---confronts a frightened woman in a grave yard. She's tied to a large tombstone. Other living skeletons cavort around them. you committed the ultimate Halloween SIN! You gave out Candy Corn! WOMAN: I had to! nobody would eat Candy Broccoli! Artist unknown. 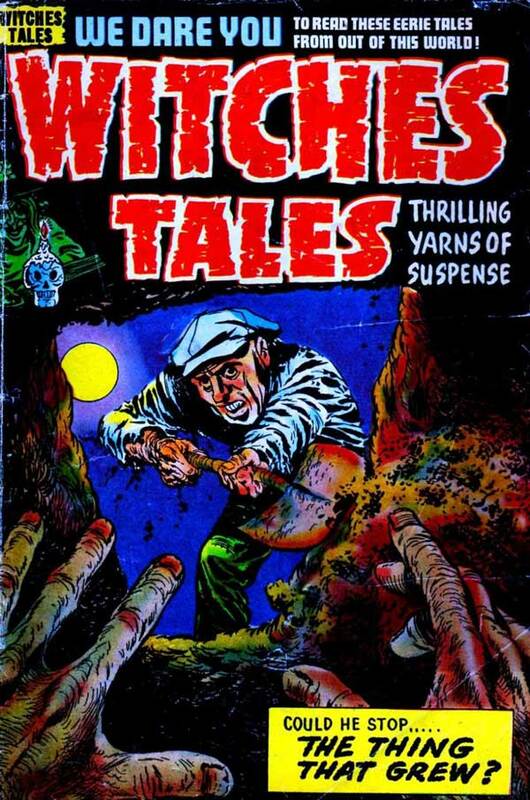 From Witches Tales #27, 1954. SCENE: Viewpoint from a man being buried alive. All we see of him are his hands. Another man is shoveling in dirt on top of the first man. MAN BEING BURIED: Wait! I was just kidding! I didn’t sleep with your wife! And, if I did, it was just once...or maybe twice! Art by Edvard Moritz from Adventures Into The Unknown #1, 1948. SCENE: Man and woman standing in front of an dilapidated and spooky hotel—one door off it’s hinges. Over 1 Million Souls Served…with Relish! MAN: Give it a chance! I got a killer deal on our room! 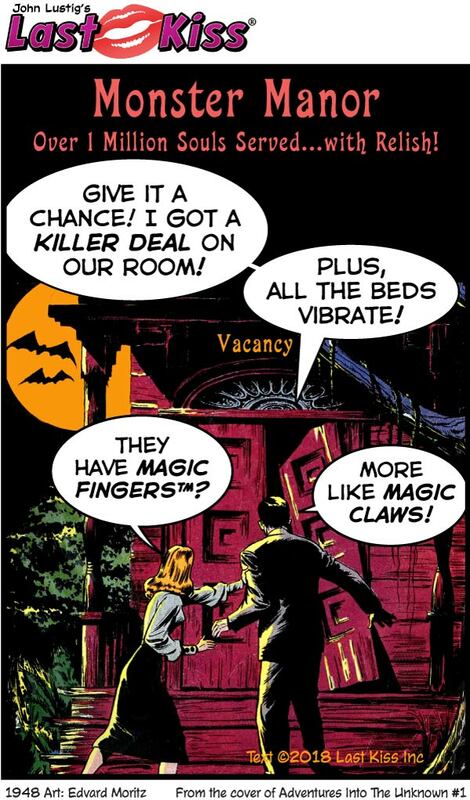 Plus, all the beds vibrate! WOMAN: They have magic fingers™? MAN: More like Magic Claws! SCENE: Man and woman standing in front of an dilapidated and spooky hotel---one door off it's hinges. Over 1 Million Souls Served...with Relish! 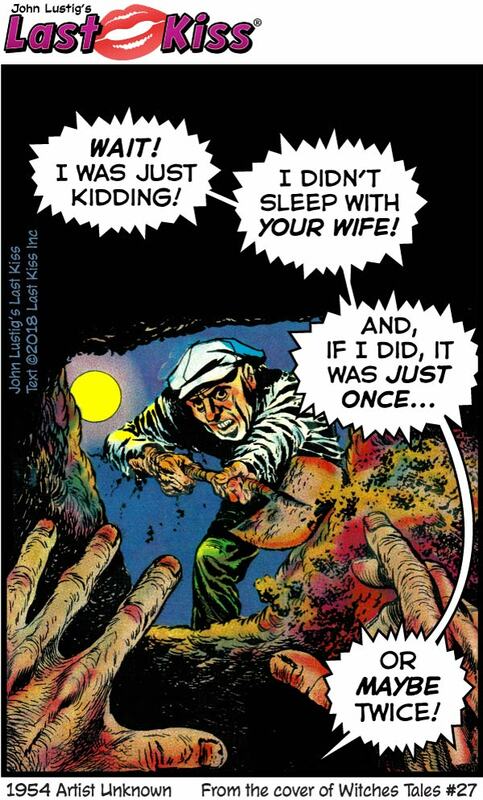 Special thanks for today’s comic treat to devil-may-care Mike Pascale! SCENE: Blonde woman talking to a guy in a devil costume. WOMAN: My costume? I’m a nymphomaniac! 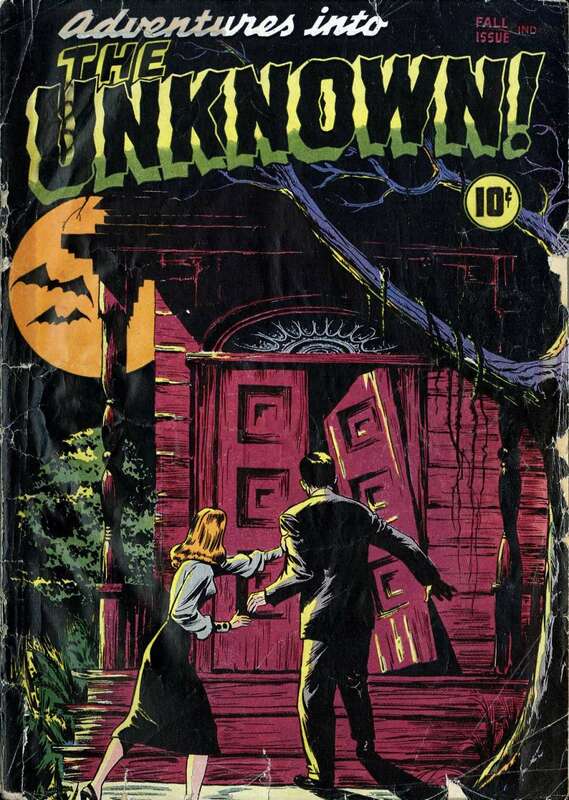 Today and tomorrow I’m re-running some horror and Halloween-themed comics I’ve done with my pal Mike Pascale. I’ll be running all-new gags Monday through Halloween. Art by Vince Colletta Studio from the story “The Love Thief” in First Kiss #37, 1964. SCENE: Vampire woman scene from the back is brushing her hair while looking into a mirror. The mirror shows the hairbrush, but not the vampire. SCENE: Adult female vampire brushing her hair as she looks in the mirror. In the mirror’s image, we only see the brush—not the vampire. 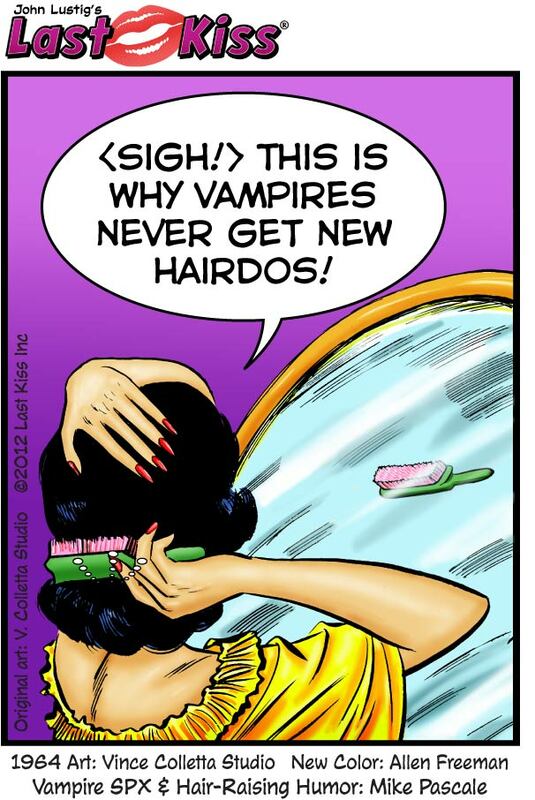 VAMPIRE: This is why vampires never get new hairdos! SCENE: Adult female vampire brushing her hair as she looks in the mirror. In the mirror's image, we only see the brush---not the vampire. 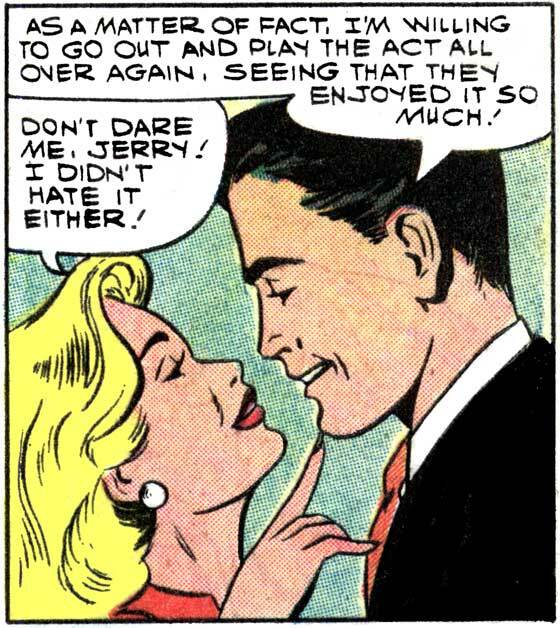 Art by Vince Colletta Studio from the story "The Love Thief" in First Kiss #37, 1964.